Playdead’s Inside opens on a young boy tumbling over a hill with nowhere to go but onward. There’s something so desolate about this one that makes it stick out – you start with no direction and no other characters on screen. The way the protagonist emerges into a forest, alone, with no guide. The color palette is subdued. There is no music. The protagonist is alone in some woods and the only direction to go is right. There is no compulsion to go on, there’s no arrow. To be quite honest, it just feels right. It’s a primal thing born in the history of video games to continue going in that direction. The act of going right goes from compulsion to survival and then to questioning. There are distinct acts and each has it’s own sort of theme. In the first act of the game, it’s survival. There are men with guns that fire without mercy and there are dogs that bite and rip and snap at flesh, leaving crimson red. The second act seems to calm down and open up to exploration and experimentation. The third act is nameless escape, frantic and blunt, to not say too much of it. In essence it creates an arc of entering a machine, exploring it’s innards, only to find the horrifying truth and escaping. The visual style is simple but lighting effects and shadows work to create their own atmosphere. There’s moments of brilliant light that show passage of time. There was a moment where the protagonist had been drenched in dark for so long it was actually a sort of shock to see that his shirt was so red in the rising sunlight. Aesthetically, it switches from cornfields and deep forests, to creeks, to old computer terminals, thick wires, and heavy designs that instill nostalgia for nuclear era technology. Music shows up only when it’s needed to increase tension and foreshadow danger. There’s nothing high energy here; at most it’s tense bass and lurid wafting music. It’s mostly ambient noise that lingers and teases danger around the corner or exhume foreboding. Puzzles are simple but challenging. They are just enough of a roadblock to feel rewarding when they are solved. They typically consist of moving objects in the environment to activate switches or hiding in shadows for just long enough to avoid detection. There’s an efficiency to them though – sometimes the solution to a puzzle is simply destroying the environment and finding ways to bring walls crashing down in your quest to go right. It’s things like that that elevate the question of what you are doing. Inside is filthy and cruel. It doesn’t shy away from showing brutality both to the protagonist and to others. A sequence early on involves writhing parasitic worms and blotches of brown as the protagonist pulls the invader from a boar’s orifice to satiate the emaciated pig. It’s a moment that is gut wrenching and sickening. There’s a primal bit of humanity that should really wretch at parasites and Playdead is completely fine exploiting that. It’s not a scene played for laughs or simple gross-out factor, but a sequence that lets the player know that nothing is off limits in this world. The control is sublime because everything has weight. It feels like the protagonist can slip free of the player’s grasp at any point, but somehow things will still be in control. He slips, slides, and tumbles over obstacles. Boards creak under his weight. Failure is met with the snapping of bone and frequently with dripping blood. Control is vital to Inside. It gives everything importance and is vital to the plot. 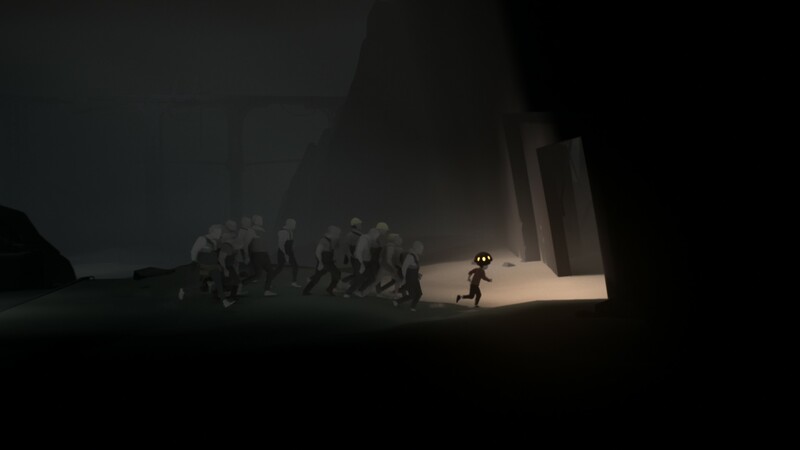 Everything about Inside’s plot is laid bare out in the environment and mechanics. One of the most interesting segments involves the player imitating the mindless; the protagonist has to march in time with the others, stopping when they stop. However this is not the most interesting mechanic. This honor falls to one that is baked into the narrative, wherein mindless drones are controlled by the protagonist who emulate his movement, creating the image of a young boy leading a parade of older men. This mechanic is demonstrated early on, but not directly. In a segment with little chirping chicks that follow the protagonist, like a mother hen. It’s a clever introduction to mechanics without Playdead showing their hand. There is no communication besides what is in the environment. There’s not a single button prompt. A simple control scheme is the main arbiter of this. Complexity comes with narrative and various interactions with the environment. There are no complicated routines to go through. Those opening moments, without direction, put you directly in the world and the only thing to really consider is what the protagonist is even doing there. The strength of Inside is in not telling the player a single thing with words besides it’s title. It communicates everything the player needs to know through experimentation. To Inside, any other question is superfluous. The only question that seems to matter is what is control without language? It plays with things players take for granted: that they are in full control of the protagonist. There’s a question as to how you even control the protagonist – are the players to assume the controller is an analogue for the protagonist’s own control and we are to identify with that blank canvas? Or, in a much darker light, shown through a revelatory moment in a puzzle, are we yet another link in the command line – a third party that controls the protagonist? The entire game seems to harken to elements of body horror and questions of language and communication, without saying a single word. There is an acceptance of these elements by the characters that is even more disturbing. There’s sympathy towards their lack-of-cause because of the way they stumble and hobble over one another, all under your command. The third act raises those questions even further. A quote by Derrida, in his lecture “Structure, Sign, and Play in the Discourse of the Human Sciences, comes to mind: “…only under the species of the non-species, in the formless, mute, infant, and terrifying form of monstrosity.” This formless mass is shown in Inside. The third act is consumed with this idea and reframes all previous engagements. It’s not a question of right or wrong but why and what. It doesn’t raise any questions and instead invites the player to make their own. There are just so many threads to pull at, and this game wouldn’t be successful at that if it wasn’t entertaining. It’s tricky in places in a way that’s satisfying to overcome. The driving mystery is one that the player themselves ask “What am I doing? Where am I going? What is going on?” These questions are the carrot on the stick that’s dangled in front of the player.